Roast white and black sesame seeds in a pan on medium flame. In other pan add jaggery and melt it and then add add Ghee. Evenly spread mixture on a flat surface and let it cool. In another bowl add custard, melted dark chocolate, whipped cream and mix it well. Take a shot glass, add crushed chikki and top it up with mousse and Strawberry. In Bowl add Maida, Wheat Flour, Salt, Oil and water and form a dough. Make small ball from the dough and stuff it crushed chikki and roll it. Heat a flat pan and roast it. 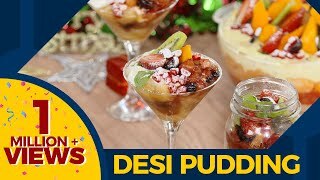 Best homemade pudding aapke bacchon ke liye try kijiye with Chef Varun Inamdar at Big Bazaar YouTube LIVE Cook Along. Watch Now! 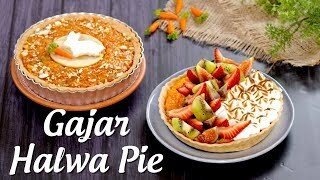 Desi Gajar ke halwe ko dijiye international twist aur banaye Gajar Halwa Pie Chef Varun Inamdar aur Chef Kabita from Kabita's Kitchen ke sath. Watch now #KuchNayaTryKarein. 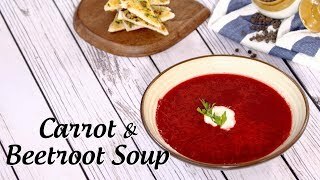 Learn how to cook winter special healthy Carrot-Beetroot Soup And Garlic Bread by chef Ripu Daman Handa only on Big Bazaar #KuchNayaTryKarein.